Up in Queensland the weather has been amazing recently and it is really starting to feel like spring. Therefore I thought it was perfect time to start breaking out flower nail art deigns again. Here is the first of what I'm sure will be many. After base coat, paint all your nails a base colour. 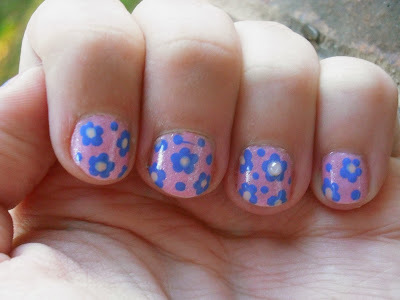 Take a small dotting tool start placing clusters of 5 dots of you petal colour nail polish over your nails. The number of flowers will depend on the size of the nail. With my short nails I could generally fit 3. With a contrasting colour to the petal colour, take the dotting tool and place dots within the clusters to create the middle of the flowers. With your dotting tool and your petal colour, go back and place dots where ever there is still a lot of space on the nail. This would make the nail look less empty without crowding it. [OPTIONAL] Take some small pearl nail decors and place them on top of some flowers while the nail polish is still wet to add something more to the design. So what are you looking forward to now spring is here?